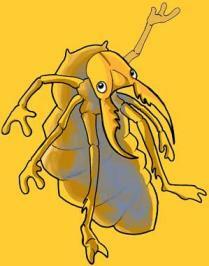 AntLionDen.com - Antlions, Doodlebugs, Ant Lion Zen Dens & Science Projects - What is an AntLion? Hi, My name is Artie! I am an ant lion, and your host on AntLionDen.com. If you are wanting to learn all about antlions and purchase ant lions & ant lion kits then you have come to the right place. What is an Ant Lion you ask? I'm not an ant, and I'm not a lion. Have you ever heard of a "doodlebug"? A doodlebug is actually an ant lion in its larval or baby stage. We get the name ant lion because we are voracious predators of ants and other insects. Do Ant Lions make good pets? Ant Lions are some of the coolest insects around. When you have an ant lion for a pet, you get a front row seat to one of nature's wildest battles. It's Survival of the Fittest, Baby! And ant lions rule! Ant lions are not only entertaining, but also very educational. You can learn about how insects think, learn, and respond to their environment. If you are looking for a pet that is easy to keep and entertaining for the whole family, then maybe ant lions are for you! Pictures of actual antlions from AntLionFarms.com. Find a bad link? Get a Free Antlion. Copyright 2018 AntLionDen.com. All rights reserved.